Tim Thulson is a cellist from Alexandria, VA, performing frequently in chamber, solo, and orchestral contexts both near home and abroad. 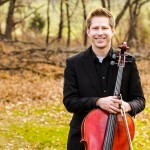 Mr. Thulson is a core member of, and serves as principal cello for, the Ars Nova Chamber Orchestra, Washington, DC's primary unconducted orchestra. In this capacity, Mr. Thulson has presented both orchestral programs and a wide variety of small-ensemble chamber works. Chamber music is an area that is particularly meaningful for Mr. Thulson, and Ars Nova provides an excellent platform for both the performance of established chamber repertoire and for the innovative application of chamber techniques within the full orchestra. Solo work includes Mr. Thulson's premiere of Levan Iordanishvili's "Character" for solo cello, as part of the Atlas Emerging Composers Forum in Washington, DC. Tours have included Japan, England, Germany, and the Middle East, where Mr. Thulson toured as a member of the Pan American Symphony Orchestra to perform in Lebanon's Al-Bustan music festival. He was part of the Pan American Symphony's Kennedy Center concert hall debut in 2013, and he continues to appear with the orchestra in its performances around Washington, each of which features a diverse array of South American music. Mr. Thulson performs frequently as part of the contemporary classical-focused Great Noise Ensemble, including Louis Andriessen's "La Commedia" for the National Gallery of Art, a performance that the New York Times called "first-rate" and "one hell of a ride." Other DC- and Baltimore-area performances include appearances with several local chamber ensembles, with Musicians of Mercy, where Mr. Thulson has served as principal cello, with the Opera Camerata of Washington, and in sacred music performances for churches including DC's Cathedral of St. Matthew the Apostle, the Metropolitan Baptist Church, and Alexandria's historic Old Presbyterian Meeting House. Close to home, Mr. Thulson appears within several of Northern Virginia's fine regional orchestras; engagements have included the Arlington Philharmonic, Opera NOVA, the Manassas Ballet Theater Orchestra, and the Fairfax Symphony. Outside the classical mainstream, Mr. Thulson has appeared behind artists including Stevie Wonder, Tye Tribbett, Michael W. Smith, Leon Lacey, Phil Keaggy, Dorinda Clark-Cole, Karen Clark-Sheard, Michael Card, Steven Curtis Chapman, Danny Oertli, and Keith and Kristyn Getty. He has recorded with artists including the Washington Performing Arts Men and Women of the Gospel Choir, David Kitchen, Pop Culture Strings, the N Street Quartet, and the Pan American Symphony Orchestra. Mr. Thulson has held board seats for the Ars Nova Chamber Orchestra and the Arlington Philharmonic, and he maintains a private teaching practice in Alexandria with his wife, violinist Mary Thulson. As a coach and adjudicant, Mr. Thulson has worked with organizations including the American Youth Philharmonic Orchestras, the Arlington Philharmonic's Crescendo Youth Chamber Music program, the Rockville Competition for Piano and Strings, Arlington and Alexandria Public Schools, and the McLean School of Potomac, MD. Mr. Thulson holds degrees from Wheaton College, where he studied with Dr. Daniel Davies, and the George Mason University School of Law. Other important influences have included Sharon Polifrone, Paul Primus, Barbara Hamilton, Jennifer Fouse, and Drs. Gregory Gentry, Paul Wiens, and William Culverhouse. Site design by Sierra Vector Creative, LLC. All materials © 2019 Tim Thulson unless otherwise indicated. Cello logo is a trademark of Mary & Tim Thulson. Visit "about this website" for more information.